Situated on a small island on the Neva Delta, across the river from The Hermitage, the Peter and Paul Fortress is the oldest surviving building in St Petersburg. 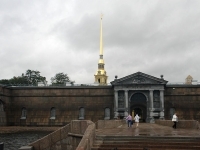 Planned by Peter the Great as a defence against possible attacks from the Swedes, the fortress never served its original purpose as the Swedish were defeated before its completion, and the six bastions at its corners were turned into high security political prison cells. The notorious dungeons held many famous people, including Alexei (the son of Peter the Great), Trotsky, and Gorky, and is now a museum. Other buildings in the fortress house the City History Museum and the Mint. The midday gun is fired every day from the roof, echoing around the city from across the water. Also enclosed within the imposing walls is the Cathedral of St Peter and St Paul, its distinctive golden needle-like spire visible throughout the city. The first church in the city to be built from stone, it has a richly decorated interior containing the tombs of every Russian Emperor since Peter the Great. Transport: Gorkoskaya metro stop, and then a five to seven minute walk. Opening times: 10am to 4pm, Thursday to Tuesday.